Hungarian psychiatrist; born at Pesth in 1849; educated at Pesth, at Vienna (M. D., Vienna, 1874), and at Göttingen, where he was assistant to Max Leidesdorf. In 1879 he became privat-docent, and from 1880 to 1882 he was head physician, at the Swetlin sanitarium, Vienna. In 1884 he became head physician at the State Insane Asylum, Budapest. Salgó embraced Christianity. Salgó is a member of the state sanitary council, of the medico-legal district council, of the Société de Médecine Mentale de Belgique, and of the Société Médico-Psychologique of Paris. His chief works are: "Werth und Bedeutung der Reformbestrebungen in der Psychiatrie" (Stuttgart, 1877); "Die Cerebralen Grundzustände der Psychosen" (ib. 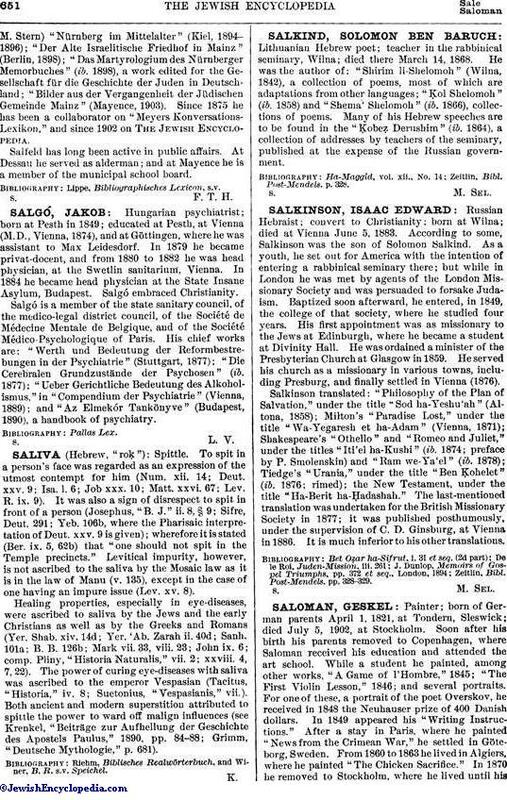 1877); "Ueber Gerichtliche Bedeutung des Alkoholismus," in "Compendium der Psychiatrie" (Vienna, 1889); and "Az Elmekór Tankönyve" (Budapest, 1890), a handbook of psychiatry.